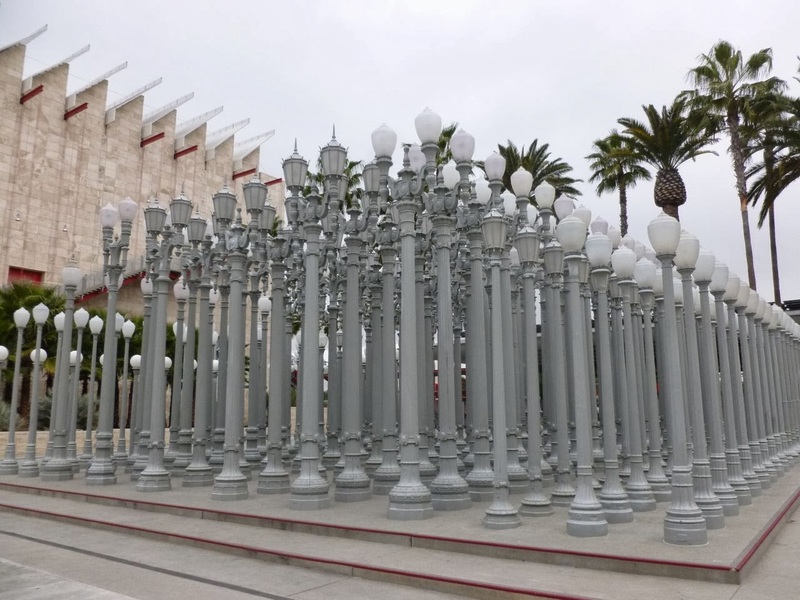 Chris Burden's Urban Light is located just outside the doors of the Los Angeles County Museum of Art on Wilshire Blvd, in between Fairfax and La Brea Avenues. 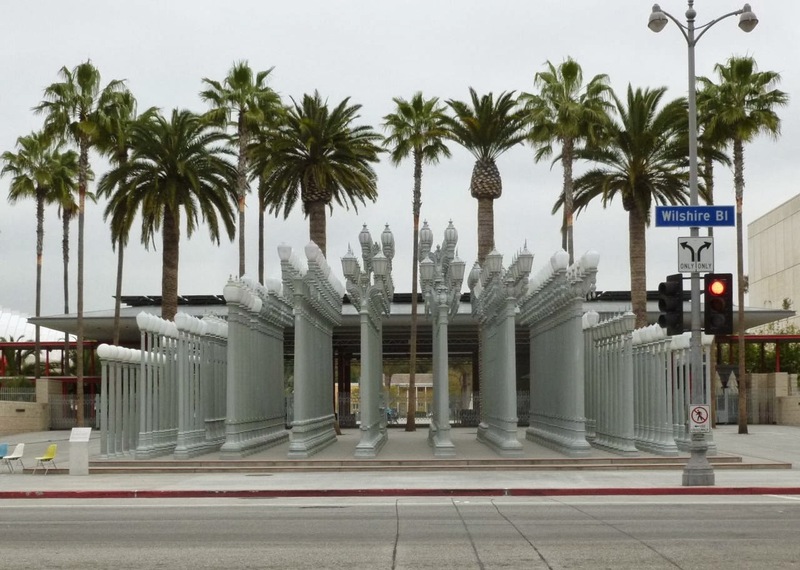 Opening in 2008, it consists of 202 restored street lamps from the 1920's and 30's, most of which are from Southern California streets. There's a total of 17 different styles, making for interesting patterns. 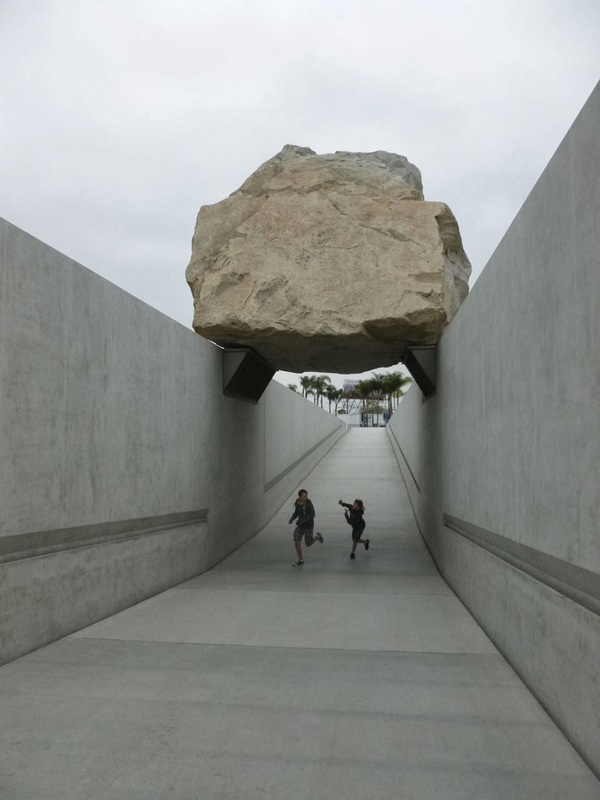 After running in and around Levitated Mass, located just a few feet away, my kids enjoyed playing in and around Urban Light. 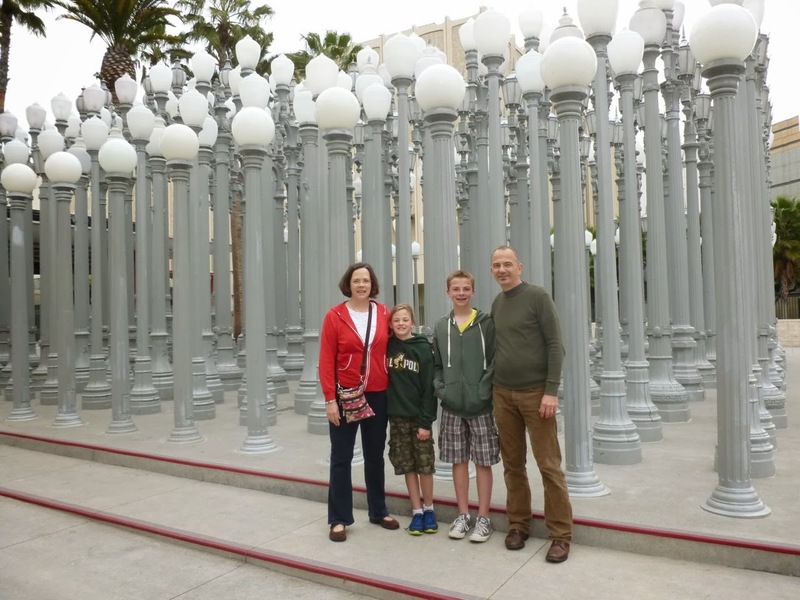 In March of 2013, my wife, kids and I were back in Los Angeles for a little three day get away. 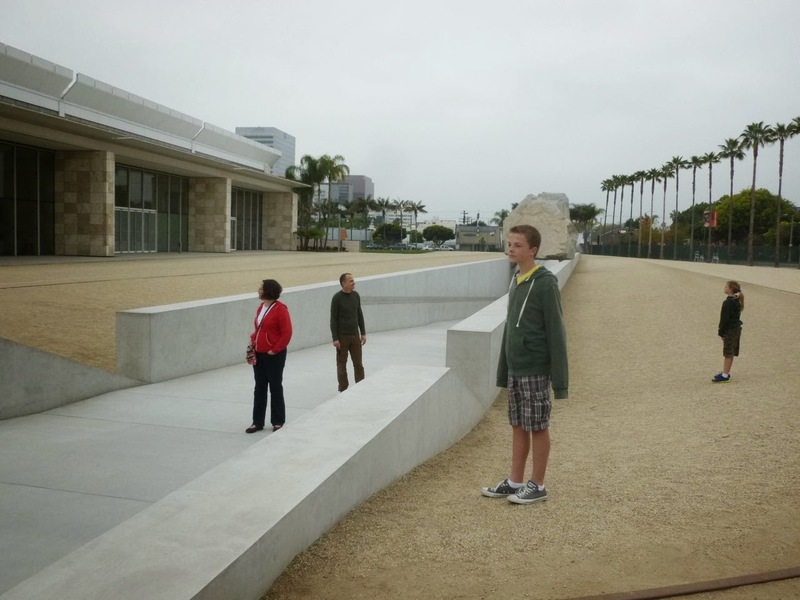 Here's a link to the different things we saw and did, including a trip up the Hollywood Sign and seeing the Space Shuttle Endeavour. Most of what we did was free - I think the most expensive thing (aside from our lodging) was seeing a 3-D movie at the El Capitan Theater in Hollywood. The fixtures are especially striking at night. If you're in the area, it's definitely worth stopping and seeing. Here's a previous post with some night photos and thoughts on Urban Light. 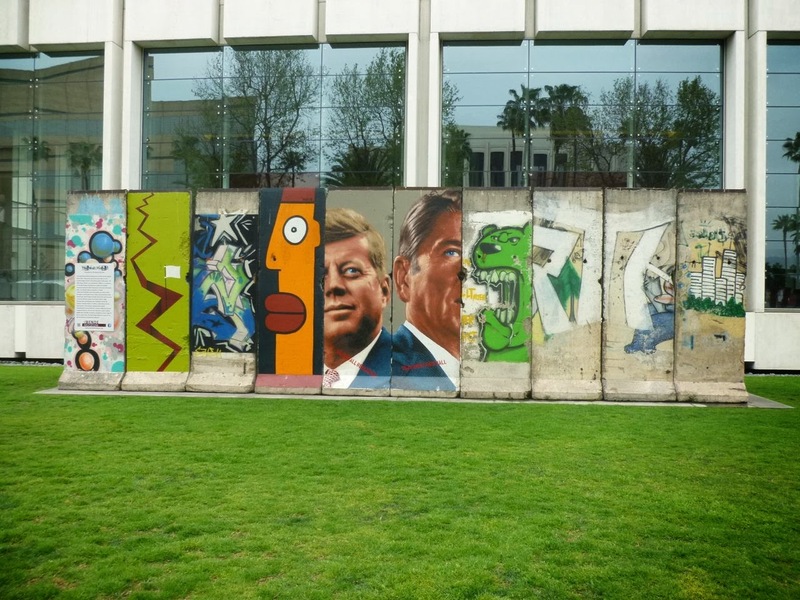 Directly across the street from Urban Light is the largest section of the Berlin Wall anywhere outside of Germany. 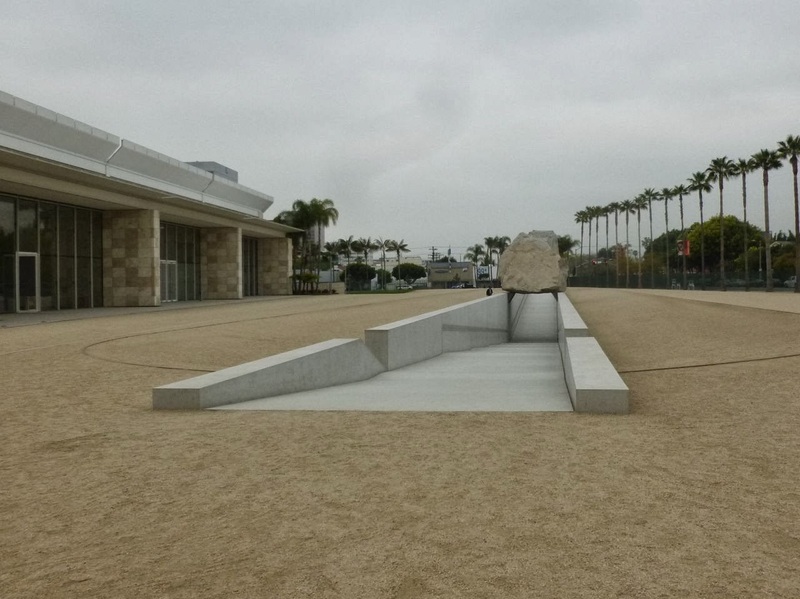 The Wall on Wilshire is located at 5900 Wilshire Blvd, directly in front of what's popularly known as the Variety building (named for the logo of the Hollywood trade paper on the top of the building). 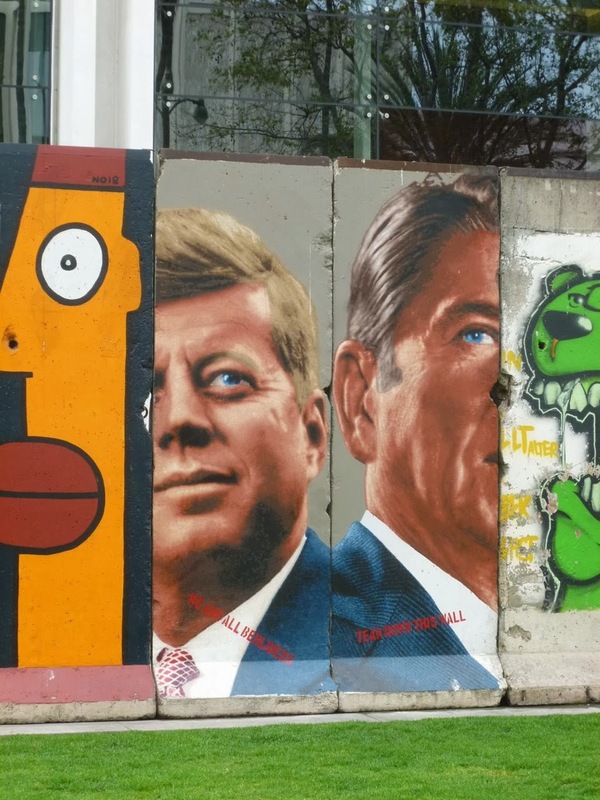 It was a great opportunity to explain my kids what the Cold War was, and the history and purpose of the Berlin Wall. This is a permanent outdoor display sponsored by the nearby Wende Museum, a museum focusing on the Cold War. I absolutely LOVE these two sections, painted by Los Angeles based artist Kent Twitchell: on the left, Democrat John Kennedy. On the right, Republican Ronald Reagan. Apparently, Twitchell had planned on painting each of these two Cold War Presidents on two panels each but was just limited to just one. Having half of each President worked out better (in my non professional opinion). 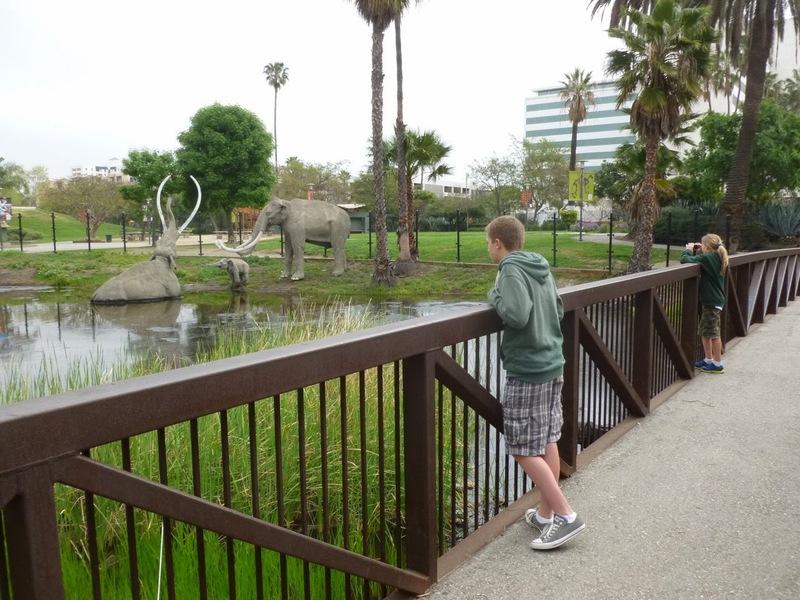 Walking back across Wilshire is the La Brea Tar Pits. 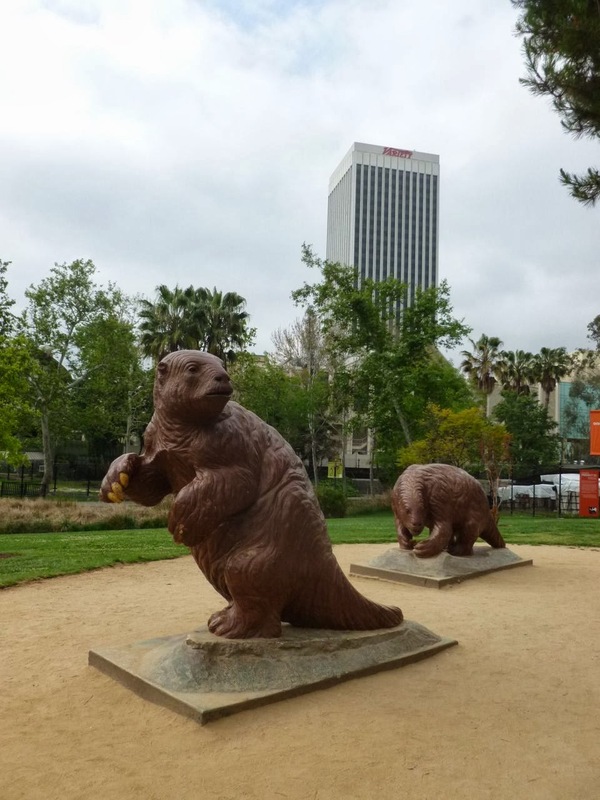 Located directly on the busiest street in the heart of Los Angeles, the Tar Pits contain the largest deposit of Ice Age fossils in the entire world. My son and daughter looking and taking photos. 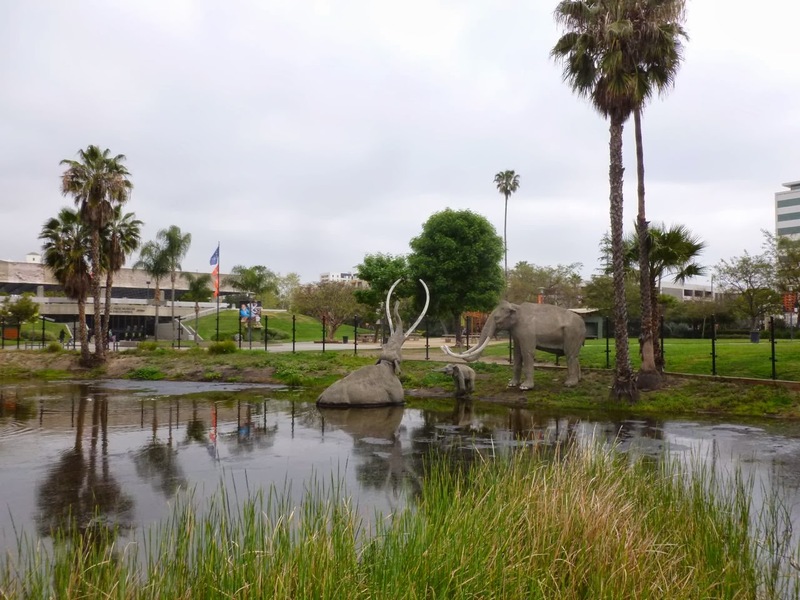 The three fiberglass sculptures of prehistoric mammoths have been around since the 1960's. Very distinctive. In the distance, in the left hand corner of the photo is the Page Museum, focusing on the fossil finds of the 100 years. 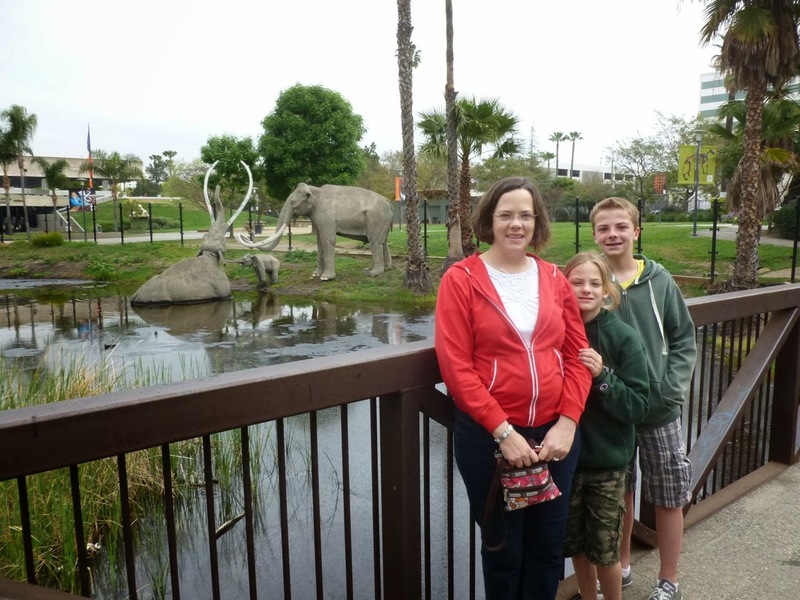 Another view of the largest of several of the tar pits. with the office buildings of Wilshire Blvd immediately across the street. Long term plans call for the Purple Line Subway to continue from Koreatown (a few miles away) west along Wilshire - immediately adjacent to the Tar Pits. That will certainly be an engineering challenge. Two Giant Sloth sculptures, each about eight feet tall, next to the Page Museum as we headed back to our car. 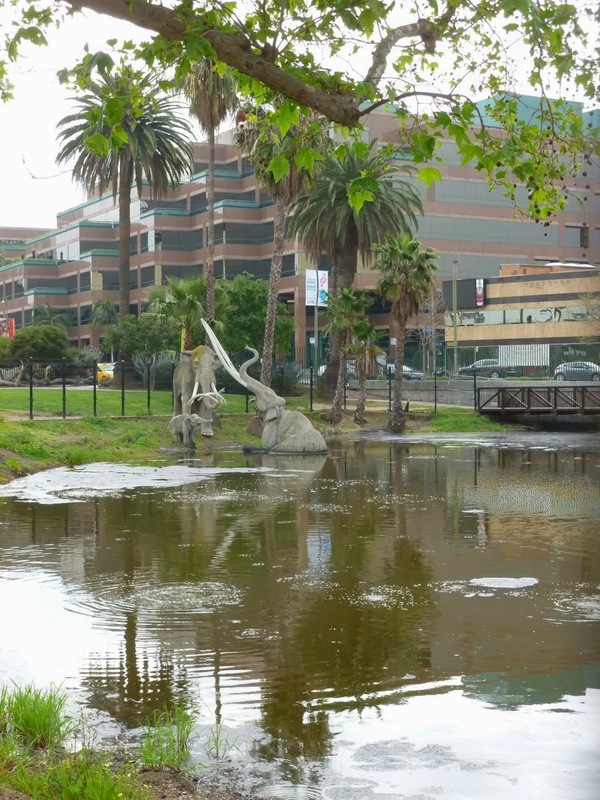 Thousands of fossils have been found in these tar pits. In the background, the 5900 Wilshire Variety Building. More next week as we continued to explore the "westside" of Los Angeles. 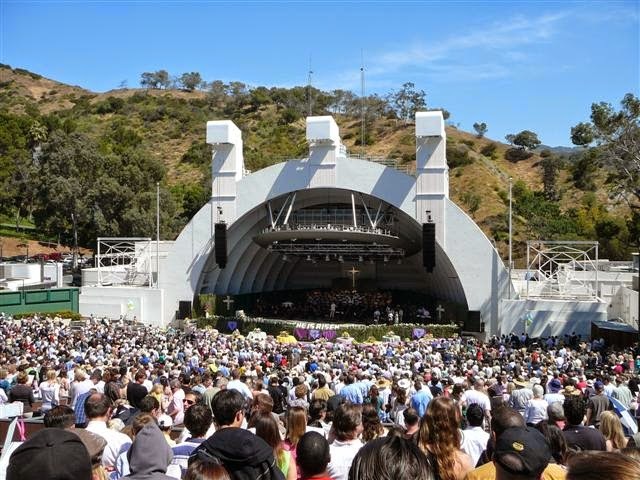 Easter Sunday - April 20, 2014 - the Hollywood Bowl will once again open it's doors to "Easter at the Bowl," an annual city-wide Easter Service, hosted by several area churches. When my wife, kids, and I lived in Los Angeles, we attended once, inviting friends who lived in the area. What a great "experiencing L.A." opportunity - we highly recommend this event! Admission - of course - is free. Doors open at 9am, the service begins at 11am. More information on "Easter at the Hollywood Bowl" can be found here. 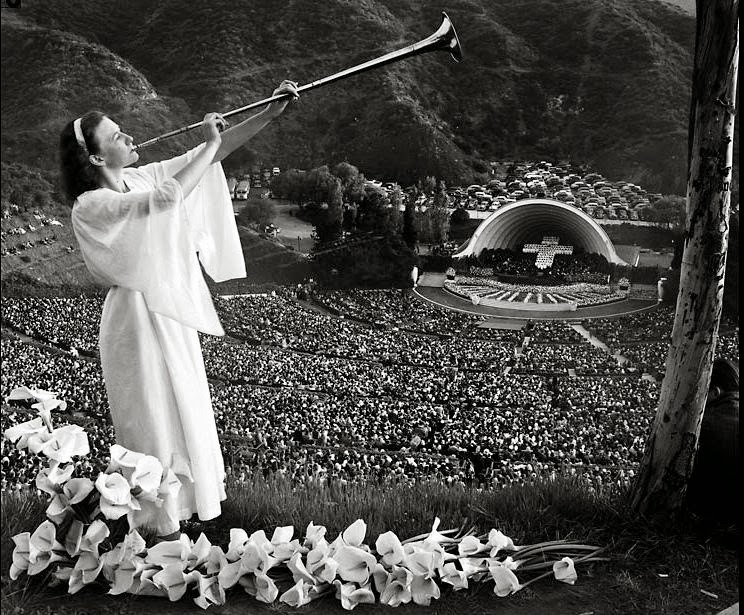 Easter Services at the Hollywood Bowl started back in 1921. Here's a "back in the day" photo I found on the Los Angeles Times website, from Easter 1947. The central message of Easter is Christ rose from the dead. Executed on Friday by via brutal Roman crucifixion, Easter celebrates the historical fact of his resurrection. Beyond the flowers, music and pageantry, perhaps a good question for both believers and skeptics is "did resurrection of Jesus really happen?" And if it did, what does it mean? University of St. Andrews professor and New Testament scholar, N.T. Wright gave an excellent answer at a lecture at Embury University back in 2008. Here's a short clip. Almost two thousand years ago, Christians in the early church greeted each other with the triumphant Christos Anesti! Christ is risen - He is risen indeed! March 2013 my wife, kids, and I spent three days back in Los Angeles on a little vacation. 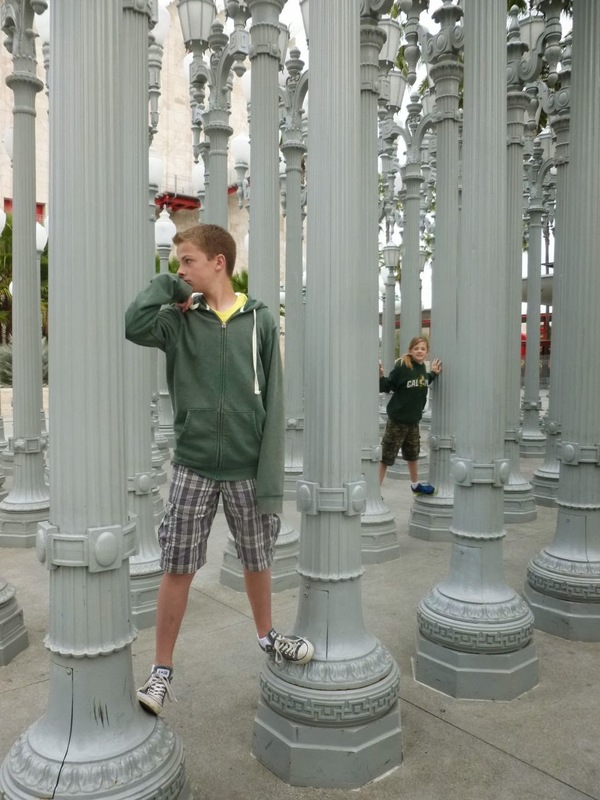 We stayed in Hollywood and saw the Los Angeles Zoo, the Hollywood Sign, the sights along Hollywood Blvd, downtown Los Angeles, the Space Shuttle Endeavour, the Griffith Observatory. Here's a link to the complete list. 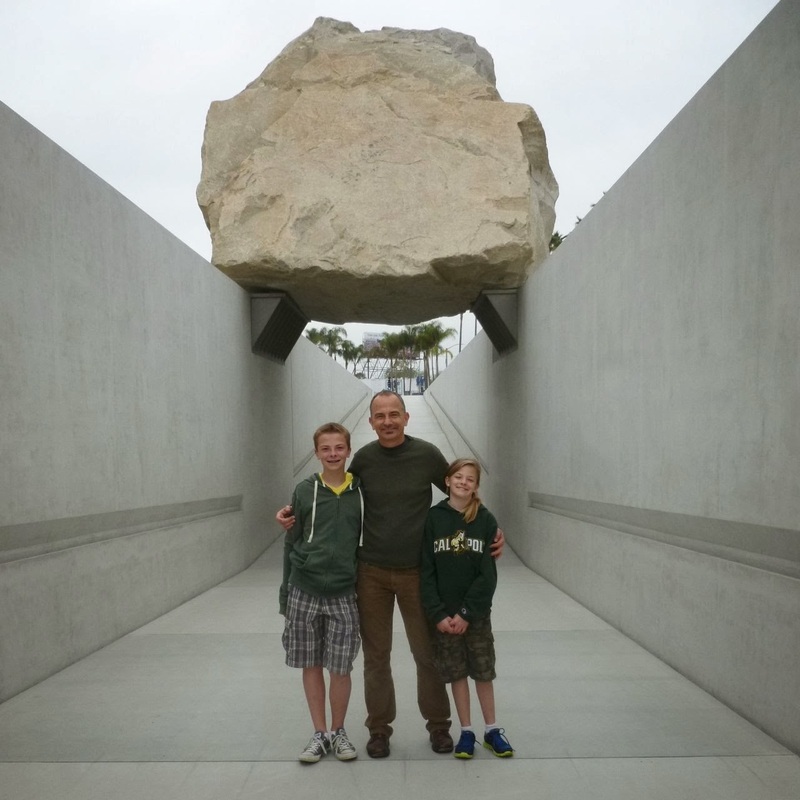 Our third, after checking out of our hotel, we drove over to see Michael Heizer's outdoor sculpture Levitated Mass at the Los Angeles County Museum of Art (LACMA). 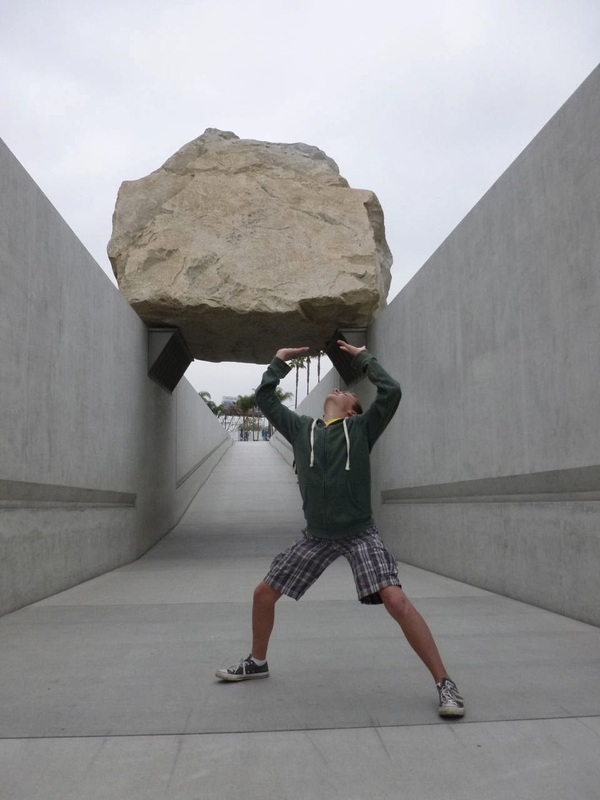 Levitated Mass is a 340 ton boulder that is "levitated" (sort of, not really) in space. When I first heard about it, I wasn't a big fan. 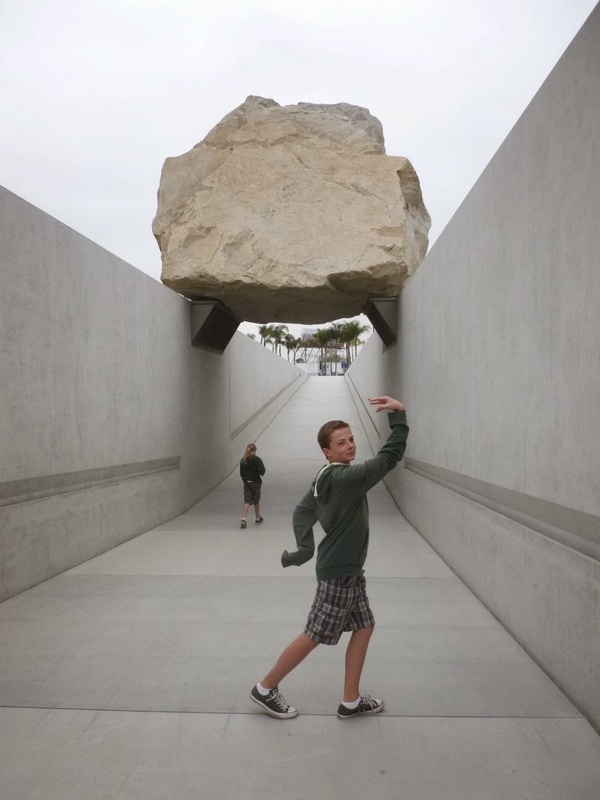 Compared to, say, Cloud Gate in Chicago's Millennium Park (which is incredible) - Levitated Mass is just a big rock. Here's a link to a post from Fall 2012, including what I thought about it then. Seeing it with my kids = totally different experience. 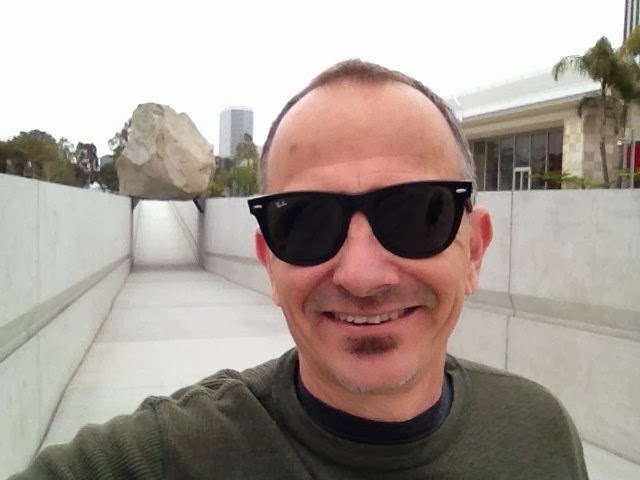 I took off the "art critic" hat and put on the "dad" hat. 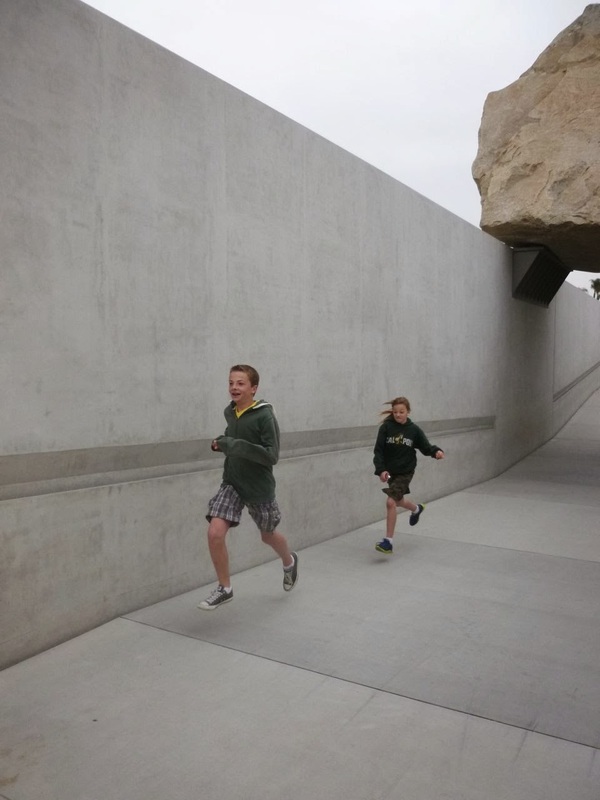 My kids loved just running around, through the long trench, and under the massive boulder. 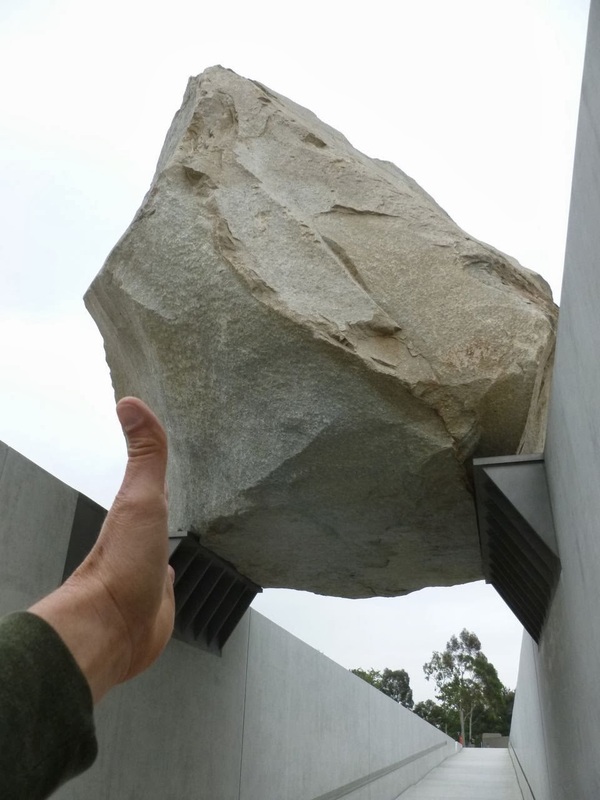 I love how the good people at 365 Los Angeles (great blog listing 365 diferent things to see and do in Los Angeles) described it: "Some rich folks pay millions of dollars for a rock the size of a marble. I say, why not get the most bang for your buck? 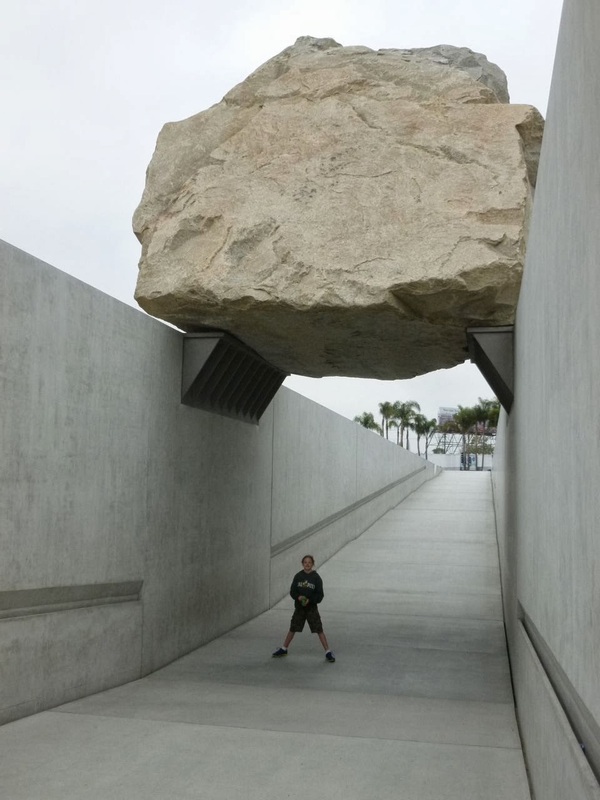 LACMA got the most show for the dough by securing the Levitated Mass, a 10 million dollar, 340 ton granite boulder, which sits upon a 456-foot-long slot." Love that: "most show for the dough." Obligatory "posting under the rock" pic. Obligatory "holding up the rock" pic. 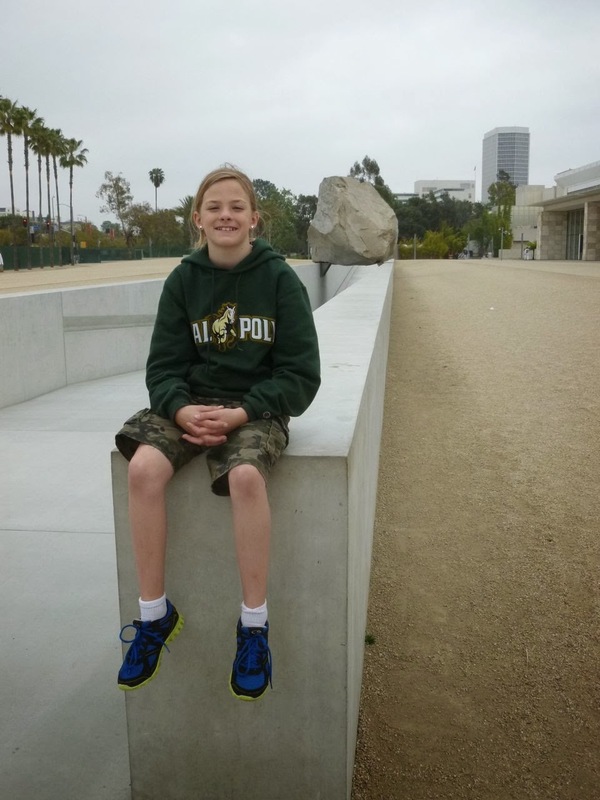 We first moved to L.A. when my kids were only 3 1/2 and 6, and spent the next five years living there. Nice to be back to see a few of our old haunts, and see things we never got around to when we lived there. When my kids were little, I thought they'd be around forever. Time goes by quickly. To any other parents out there, be sure and spend time with your kids! 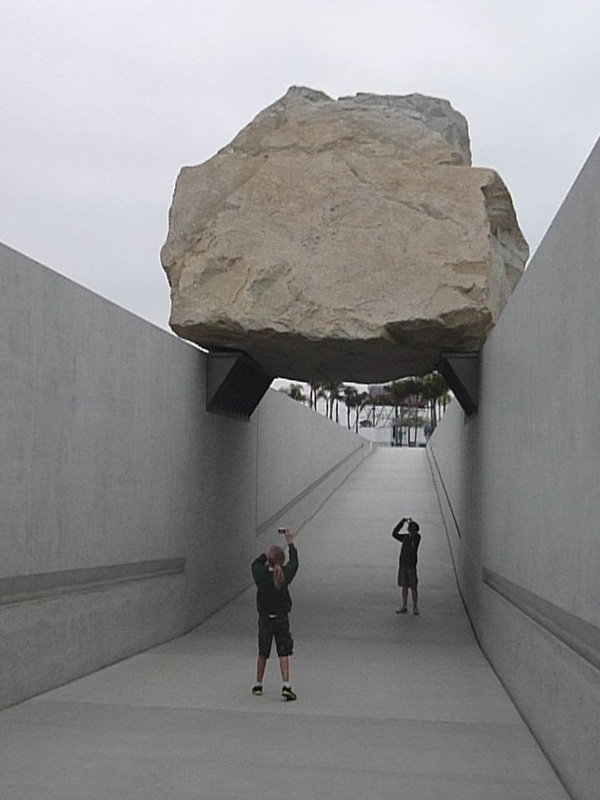 Apparently, Levitated Mass is designed to last 3500 years. Which seems like an eternity. But in light of eternity (and, yes, there is an eternity) it's the blink of an eye. By the way, if you're in L.A. and your looking for small, "sparkley" rocks - try either Rodeo Drive - or the impressive gem display at the Los Angeles County Natural History Museum. One of the few selfies I took on our trip. For something I previously thought was pretty dumb (in terms of art) I sure eneded up taking a ton of photos. Maybe because it early in the day, and my kids were still "fresh." I called this our "album cover" photo. A security guard walked by and was kind enough to take several family photos. 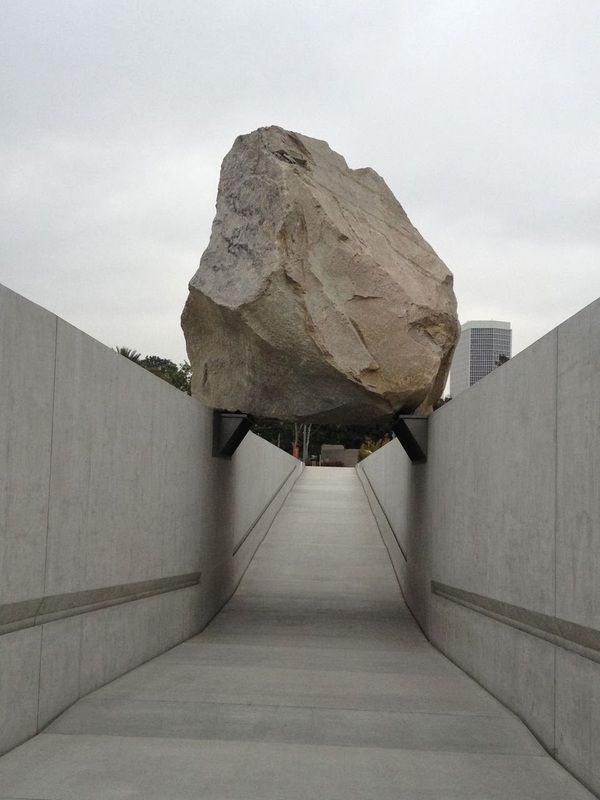 "Levitated Mass" is located on the Los Angeles County Museum of Art grounds at Wilshire and Fairfax. It's open from 7am to sunset - and there is no admission charge (nice). Is it worth a special trip? Probably not. 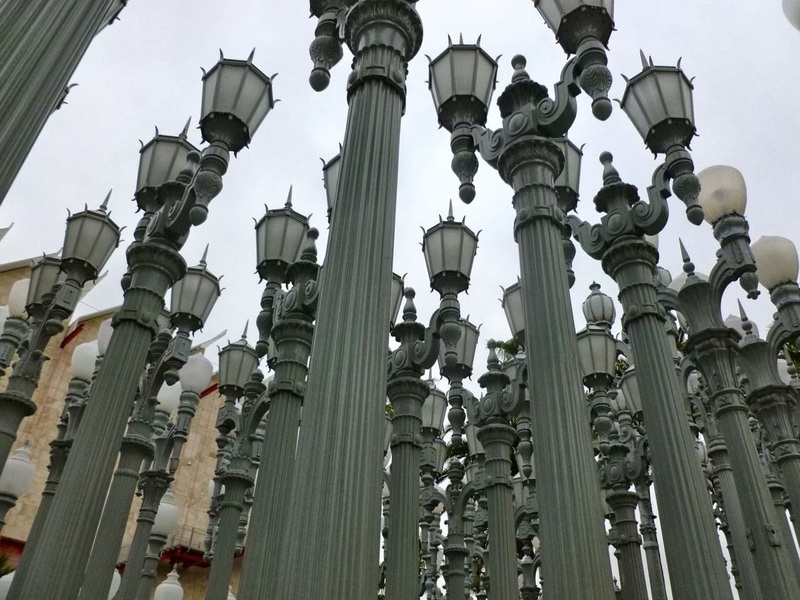 But there's a slew of other things to see and do within a five minute walk, including Chris Burden's Urban Light, the largest section of the Berlin Wall outside of Germany, and the world famous La Brea Tar Pits. 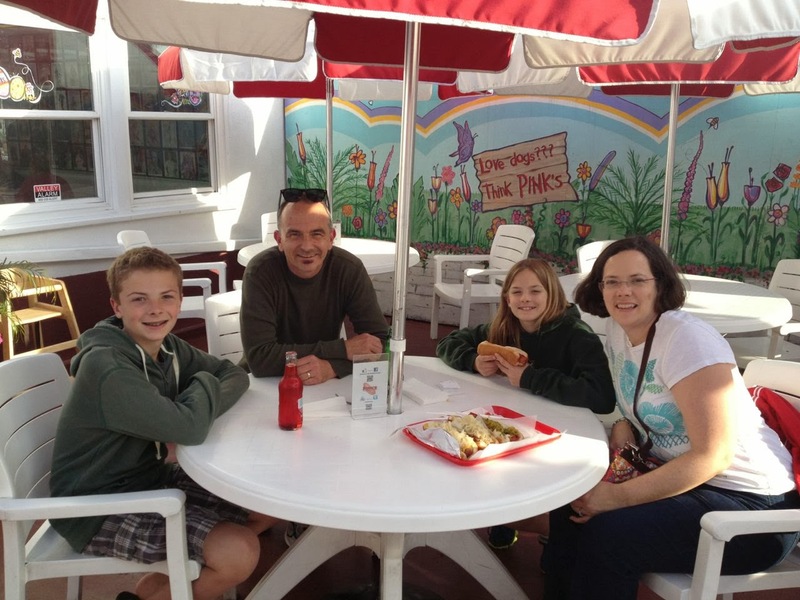 In March of 2013 my wife, kids, and I were back in Los Angeles for a little three day get-away. Here's a list (with additional links) of what we saw and did. 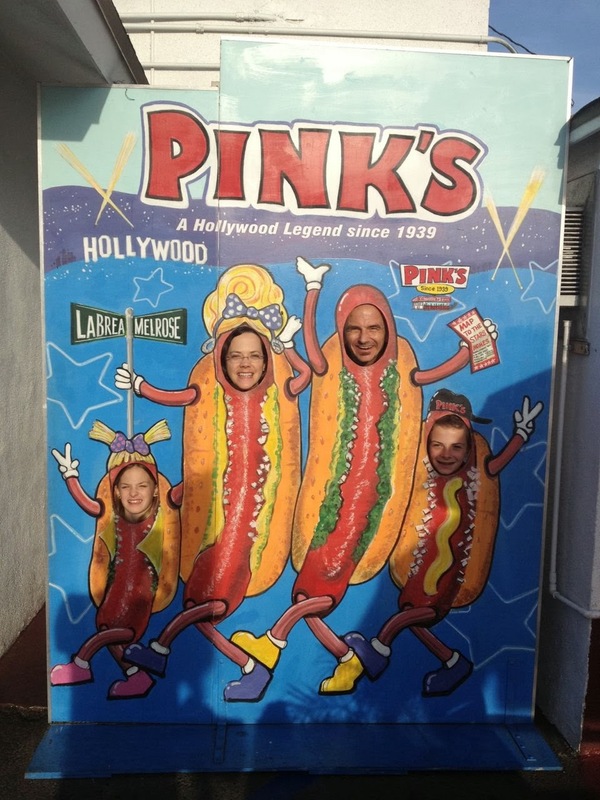 Day 2, after an afternoon visiting the Space Shuttle Endeavour at the California Science Center, we decided to have dinner at Pink's Hotdogs. Pink's is neither high end or healthy. But no trip to Los Angeles is complete without a visit to this famous L.A. Landmark. 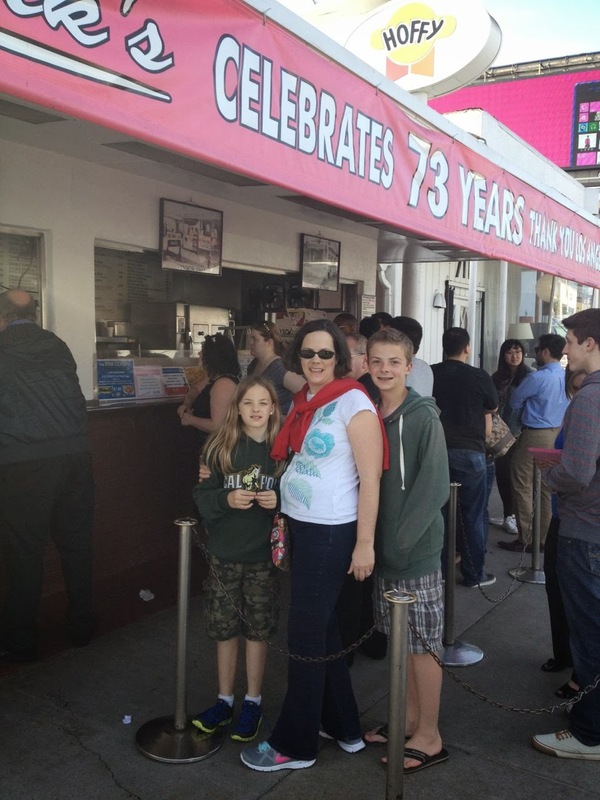 Pink's is one of those hotdog stands that over time become legendary. As you can see from the sign, last year they celebrated their 73th year. What makes Pink's so famous? First, they've been around since 1939. In L.A., that's an eternity. Second, their menu. Sure, you can get a standard hotdog pretty much anywhere. 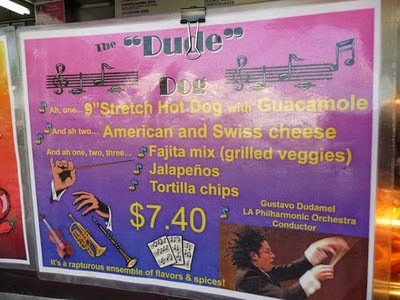 But where else can you get a Mulholland Drive Dog, a Hollywood Walk of Fame Dog, a Huell Howser Dog, or a L.A. Philharmoic Conductor Gustavo Dudamel "Dude" Dog? Third, Hollywood. Thanks to it's location and the fact that it's open until 2am (3am on weekends), Pink's is a favorite among the Hollywood crowd. You'll see dozens of stars photos with endorsements lining the walls. Kinda fun. Finally, Pink's is not McDonald's. It's a small, local establishment with a funky vibe and character that says "you're in Los Angeles." Obligatory family photo. Good times. 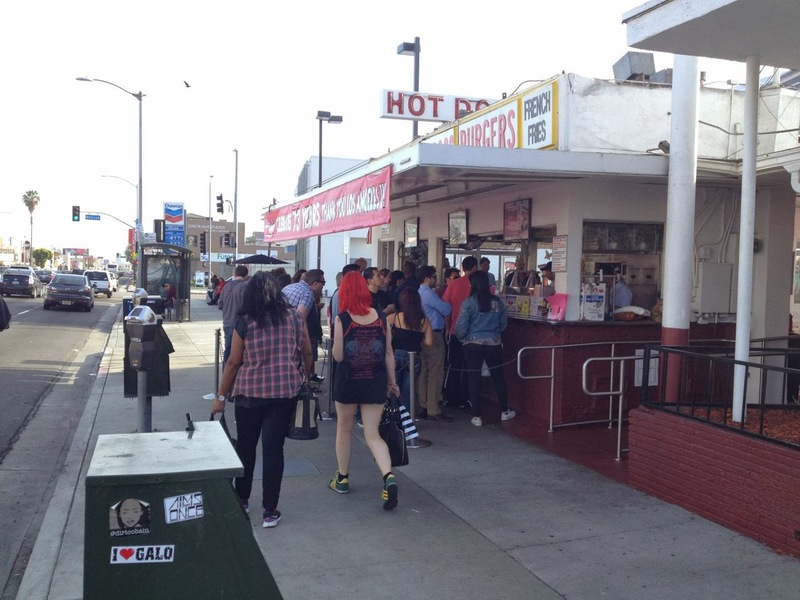 Pink's is located on the corner of La Brea and Melrose. There is a small parking lot with free parking. If you're driving (which we did) you enter the parking lot off La Brea (heading south). If you park on the street, be careful - there is no parking after 3pm. You'll get ticketed, and possibly towed (which almost happend to me once when we lived in L.A.). After dinner, we headed back to our hotel. 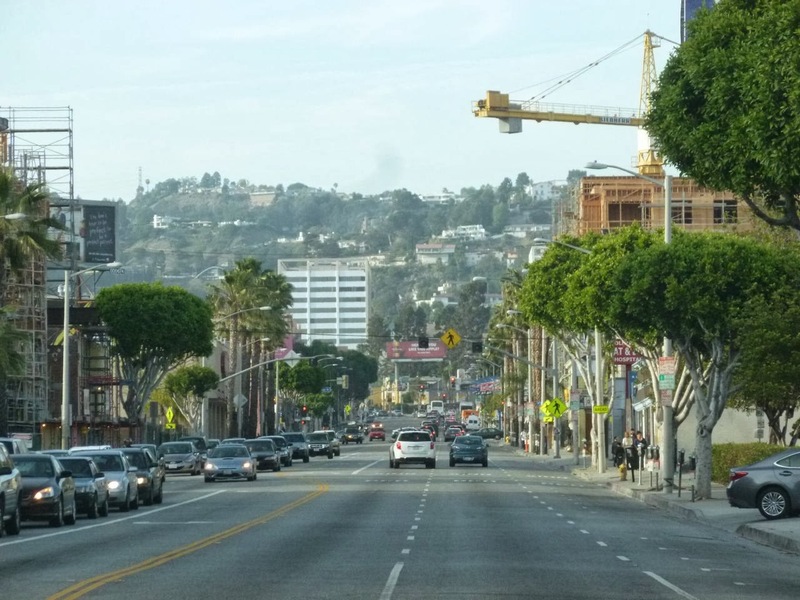 This is driving up La Brea, with the Hollywood Hills in the background. 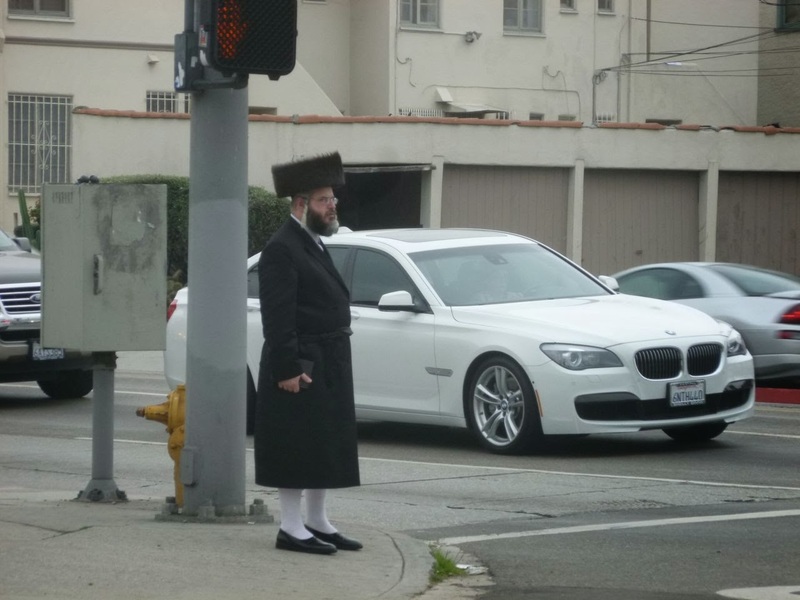 We were in Los Angeles around Passover. 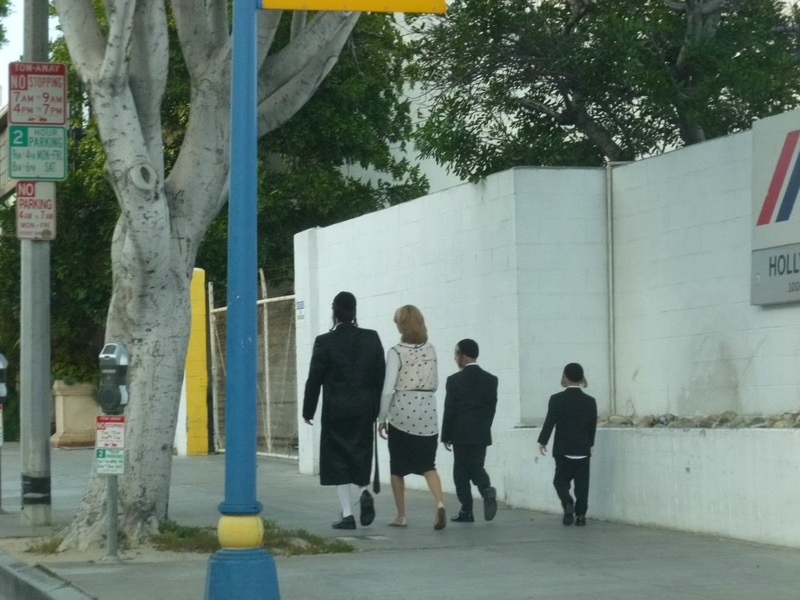 Above, an Orthodox family walking home from a local synagogue. Los Angeles is home to America's second largest Jewish community (New York City, of course, is first). "I am a stranger in a strange land" wrote Moses. As a follower of Christ, I think there are numerous things I and other Christians can learn from the Jewish community (whether Conservative, Orthodox, or Reformed). Here's some thoughts from a previous post from a walk through the Pico Robertson district of Los Angeles a few years back. A block from our hotel, located at the corner of Sunset Blvd and La Brea Avenue was a mini-mall (one of about a billion in Los Angeles). 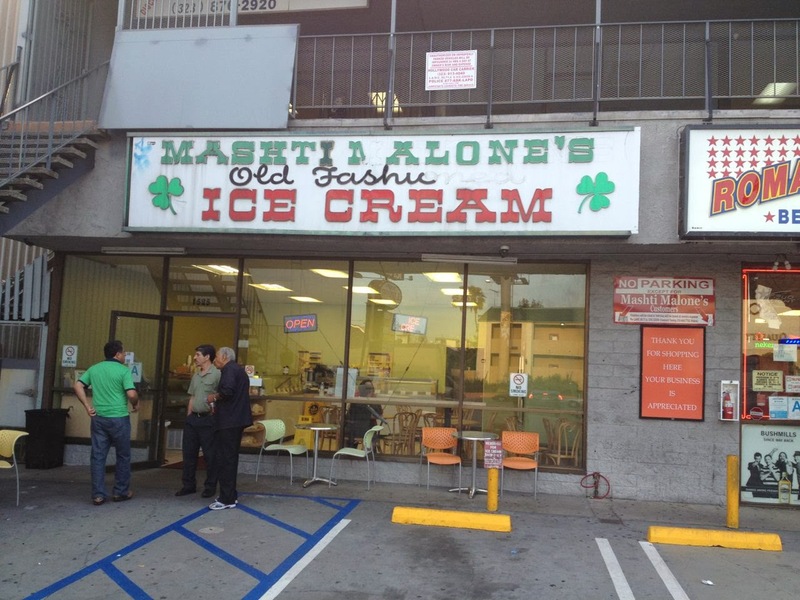 We walked over after dinner to check out Mashti Malone's Ice Cream. Brothers Mashti and Mehdi Shirvani, originally from Iran, have carved out a nitch of selling uniquely flavored ice cream for the past 25 years. 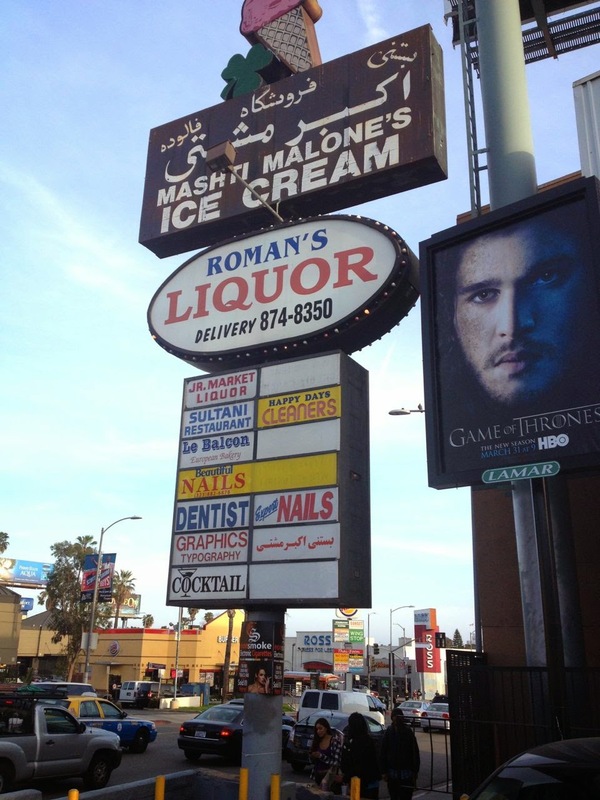 Ever have Rosewater or Saffon ice cream? Either had we. Don't worry, in addion to exotic flavors, they also have traditional favorites. Good ice cream - and was nice to be able to just walk over. Here's their website. 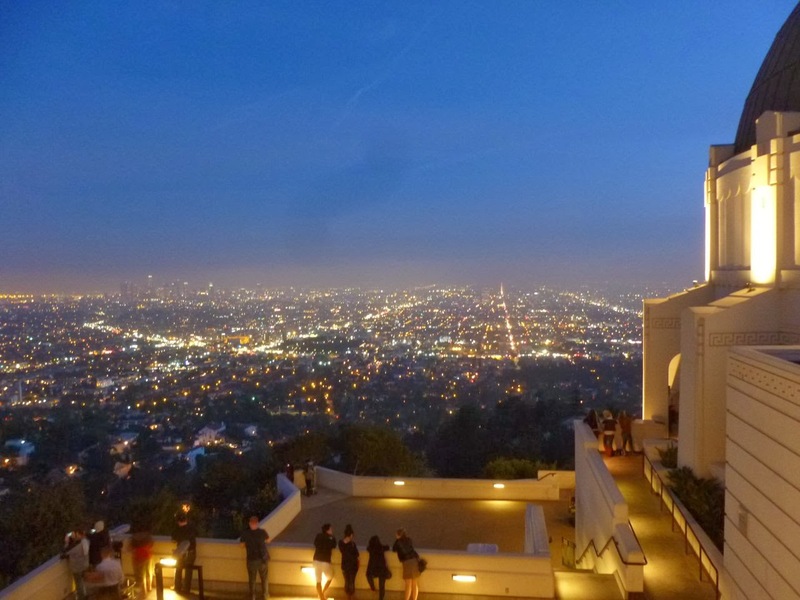 After dinner, my daughter and I drove up to the Griffith Observatory. 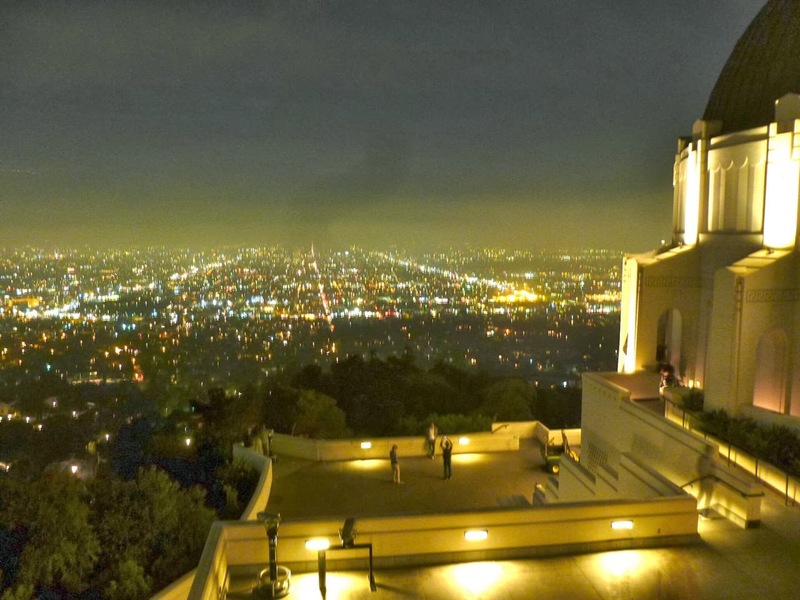 Like almost everything on our three day excursion, the Griffith Observatory (located in Griffith Park) is free, including parking - never a given in la-la land. Despite the 45 minute wait, my daughter really wanted to look through the big telescope. Waaay too dark inside for my little camera, this photo is from Trip Advisor. 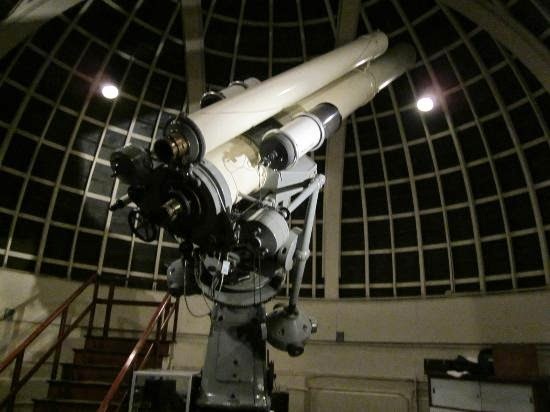 Since opening in 1935, more than seven million people have put an eye to Griffith Observatory's original 12-inch Zeiss refracting telescope. Incredible fact, but more people have looked though it than any other telescope in the world. We walked around inside, looking at the displays, including the pendulum in the lobby. 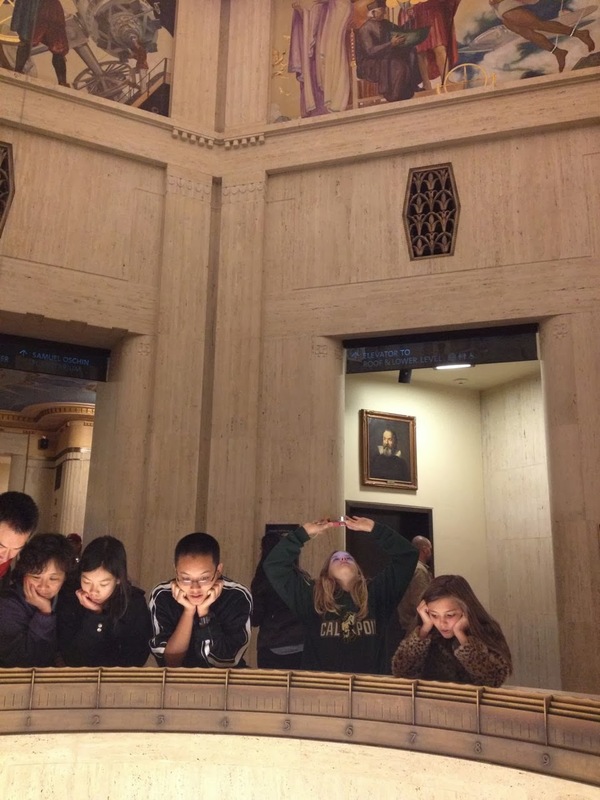 My daughter taking photos of the murals on the ceiling. 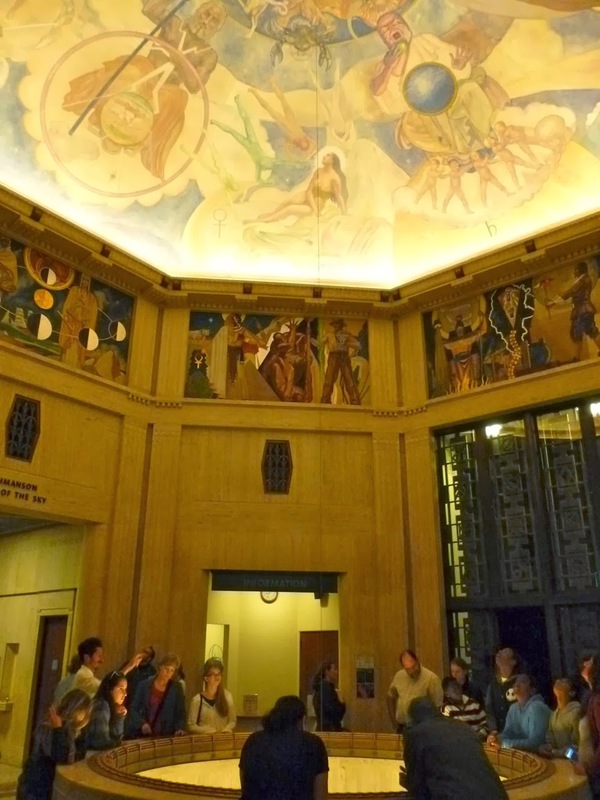 The Observatory opened in 1935 and has some cool art deco murals. Here's a link with more photos and info from a previous visit back in 2009. 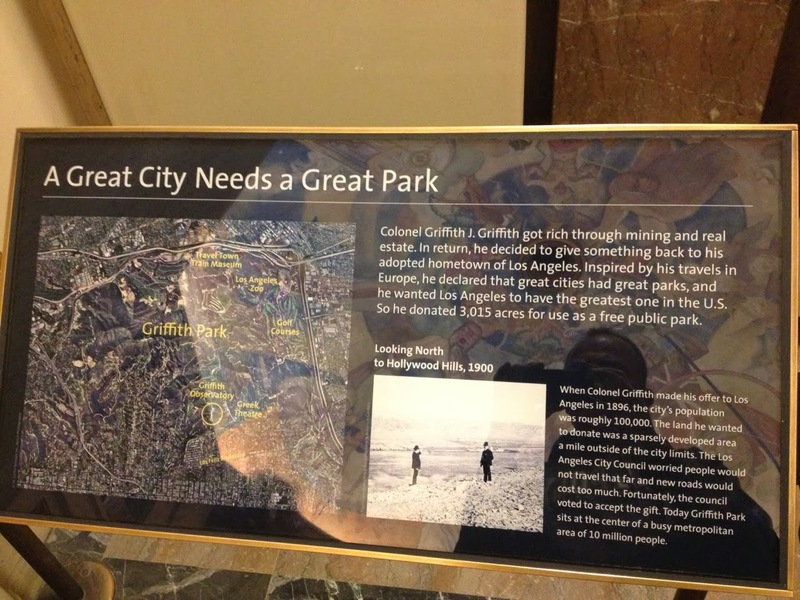 "A Great City Needs a Great Park" - some information about the history of Griffith Park. As the Observatory is perched on a steep hill, there are also some outstanding views of the city. 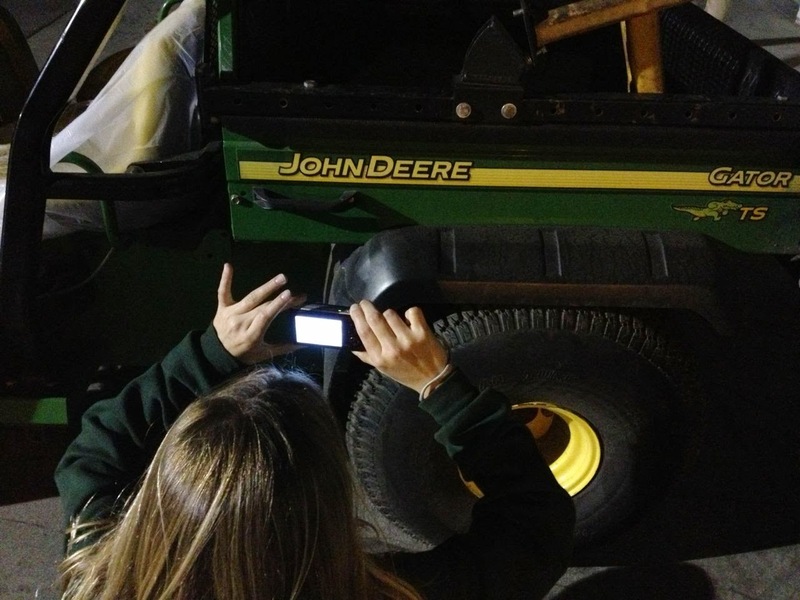 My daughter snapping a photo of a small John Deere utility vechicle so show a couple "John Deere" neighbor kids. 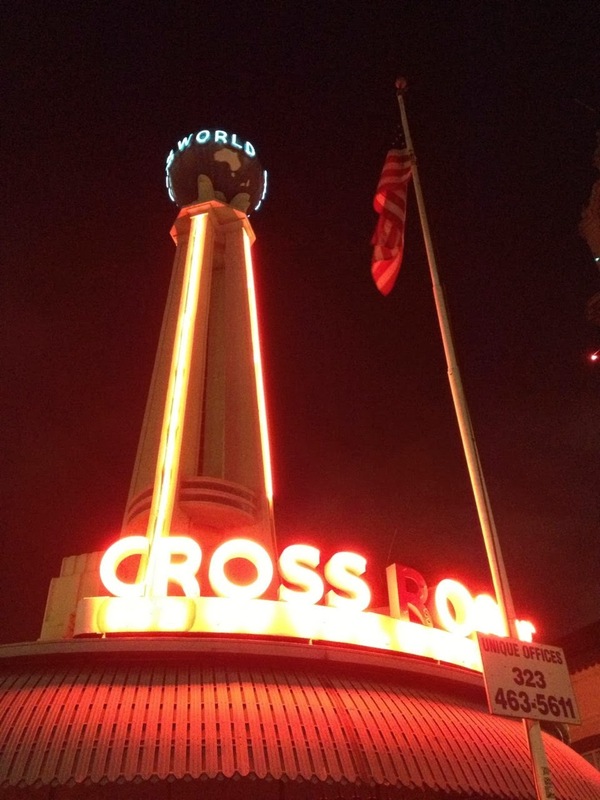 Driving back to our hotel on Sunset Blvd, we passed by the Crossroads of the World, which opened in 1936 and is described as America's first outdoor shopping mall. Unfortunately, it's closed at night. My daugher was tired - so maybe that was a good thing. Here's a link with more photos and information from a visit during the day with my wife back in 2011. 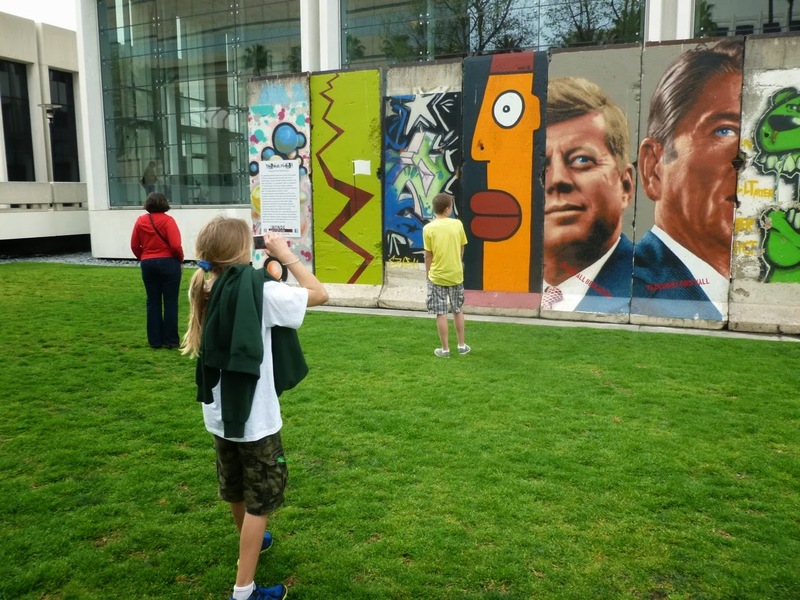 More in the next post, including taking our kids to Wilshire Blvd's "Miracle Mile" district to see "Levitated Mass", Urban Light, the La Brea Tar Pits - and the largest section of the Berlin Wall outside of Germany.